File photo of another meeting between Pope Francis and Bishop Scicluna. The Pope is “shocked” by Malta’s Civil Unions Bill, which will allow gay couples to adopt children, Auxiliary Bishop Charles Scicluna has told The Sunday Times of Malta. Defending his decision to use his Christmas homily to reiterate that a family had to be built around a man and a woman, Mgr Scicluna said he had aired these concerns with Pope Francis when he met him on December 12. 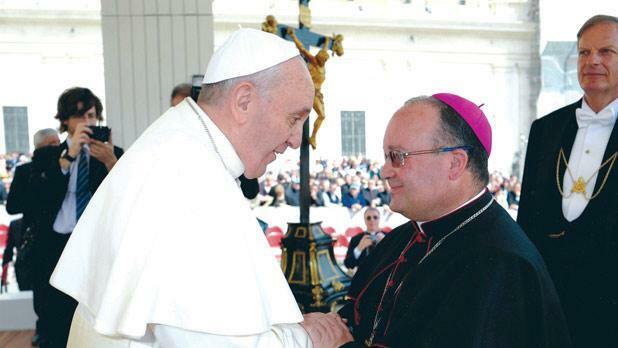 “We discussed many aspects...and when I raised the issue that’s worrying me as a bishop [the right for gay couples to adopt] he encouraged me to speak out," Bishop Scicluna said. Full story in The Sunday Times of Malta and the e-paper on Timesofmalta.com Premium.